You are here: Home / Science and Tech / Windows? Linux? OS/X? Why choose? What the devil are we going to do with all the power that the latest computers offer, given that soon you won’t be able to buy a machine with less than two cores on the CPU and less than a gigabyte of RAM? Well, one possibility that more and more people are taking advantage of is the ability to run multiple operating systems at the same time. I’m not talking dual boot here, where you choose which operating system (OS) you want to run when the computer starts. I’m talking about working happily away in Linux, feeling a need to run a Windows application, then firing up XP in a window as though it were an application itself, and then running the Windows application there. When done, one can then shut down Windows or effectively alt+tab back to Linux. How is this magic performed? Through the emergence of virtual machines. 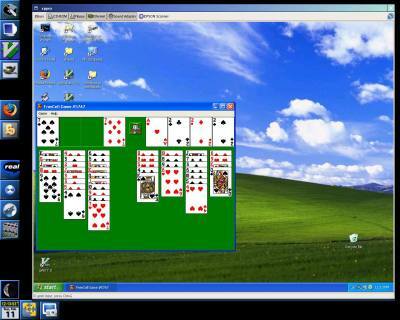 A virtual machine is a computer created entirely in software. Once you’ve created one on your desktop or notebook, you can then install any supported operating system on it, and run applications within it. Here is a screen shot of Windows running in a virtual machine under Linux. The window manager being used here, WindowMaker, isn’t from by one of the standard, windowsy software developers like KDE or Gnome, but I like it. But first you have to create that virtual machine. For PCers, the software to use is VMware Workstation. It’s a bit pricey at $189.00, but the 30 day free trial is completely functional, and once it expires you can use the free VMplayer to continue to run any virtual machines you’ve created. At the moment, VMware does not support OS/X, so PC users can’t use it to create a virtual Mac (or are on their own if they try). VMware also has a free product, VMware Converter, which offers to “virtualize” an existing Windows install, but I haven’t tried it so won’t comment, other than to say it looks interesting. Mac users are especially blessed in that they can use all operating system families that run on Intel/AMD processors, with OS/X as the host and virtual machines for the others. The software that performs the magic is called Parallels Desktop (cost, $79.99). It looks as though Parallels has released a product for the PC as well for $49.99, Parallels Workstation. I may give that a try. If the Parallels offering is as good as VMware Workstation, that could be bad news for the latter, though VMware still seems to regard developers, not home users, as its primary market. I get the impression that Parallels has a better appreciation of where this market is going. Virtual machines are limited only by the hardware resources at hand. Each virtual machine eats a chunk of RAM and consumes CPU cycles. Until recently, that meant they were mostly used by software developers with enterprise level hardware to play with. But thanks to the ever increasing power of run-of-the-mill PCs, and, in the case of the Mac, Apple’s brilliant decision to go with multicore Intel processors, they’ve now become an option for ordinary mortals. Microsoft, ever wary of potential threats to their monopoly, will not allow regular versions of Vista to be run on a virtual machine. Instead they require those wishing to do so to buy a special, more expensive version called Vista Uber Alles. (Okay, the real name is “Ultimate”.) Vista Business and Enterprise are allowed as well, though Enterprise is the really good one mere human beings can’t buy, and shouldn’t look for through, say, unlicensed channels like thepiratebay.org. It probably hasn’t been cracked yet, anyway. My solution? Forget about Vista and run Windows 98SE, or 2000, or XP, ideally in the corporate version that doesn’t require activation. Again, don’t go looking for the corporate XP at a site like thepiratebay.org; if you do, the BSA will get you. While I am a die hard Linux user, I do acknowledge there are some things for which Windows is better — backing up DVDs, for example. 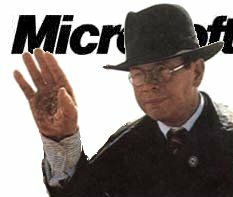 Of course, the best Windows software for this can’t be downloaded from the developer’s sites since they’re afraid of corporate lawyer assassins, so you have to know how to look for it and not get infected with a lot of spyware/adware/trojans along the way. Which just reinforces my love of Linux, especially the culture. And now, not being able to run Windows software isn’t a problem. Because I can. But it might not be long before I switch platform to Mac. OS/X, Linux, and Windows, all running on a single machine? Sweet. I wrote in an earlier entry about Bill Gates actually becoming critical of some Digital Rights Management (more accurately known as Digital Restriction Management). Now Steve Jobs has joined in the criticism. Apparently iTunes has to have DRM because the record labels insist. It’s not Apple’s fault.